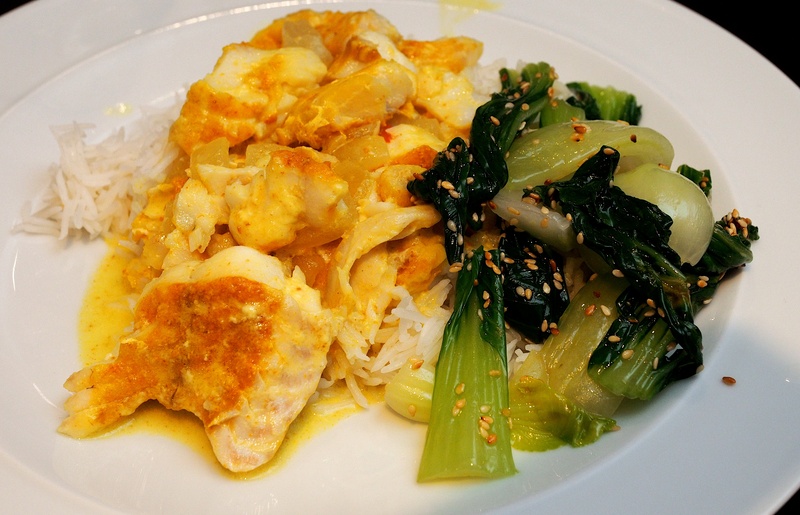 This has a delicate flavour and is more about the fish than the curry – in a good way. Great fresh flavours and excellent served with the Sesame Pak Choi. Place the fish on a plate. Mix the ground seeds with the turmeric and salt, then scatter over the fish to coat. Place a wide saucepan or large frying pan on a medium heat and pour in the oil. When the oil is hot, add the onion and sauté for 7-10 minutes or until very soft and colouring at the edges. Lay the fish on top of the onion and scrape in any seeds and spices from the plate. Cook the fish for 2-3 minutes on each side or until light golden. Pour in the coconut milk and add the chilli. Bring to the boil, then reduce the heat and simmer for 5-10 minutes or until the fish is cooked through. To finish, add a squeeze of lemon and more salt if needed. Serve immediately with steamed rice and the pak choi below. Remove the stems from the pak choi and cut into similar-sized lengths. Bring a large saucepan of salted water to the boil. Add the stems and cook for a minute or two or until just tender, then stir in the leaves and drain immediately. Place in a dish, sprinkle over the toasted sesame seeds and sesame oil and serve.